We have decided to cancel the rally planned for Sunday, August 19 at Rialto due to the extraordinary interest combined with the Olympic National Park’s requirement that we limit the size of the event and move the rally off the beach. After we announced the rally to kick of the “Save Our Coast” hike on August 19, many Washingtonians reached out to express their interest in joining us to celebrate Washington’s coast and to send a message to the Trump administration that oil rigs are not welcome off our shores. Our plan was to hold the rally on Rialto Beach. That is no longer possible because the Olympic National Park required us to move the celebration event to Mora Campground, which is 1.5 miles inland. Significantly, the Park also limited the size of the rally to 70 people. We understand that these restrictions are intended to protect the beach, and we respect them. Given these limitations, however, the considerable interest, and our inability to control how many people arrive, we made the difficult decision to cancel the Rally at Rialto. We apologize to those who planned to join us to celebrate our beautiful coast. The “Save Our Coast” hike will proceed beginning Sunday, August 19. OLYMPIA — Attorney General Bob Ferguson announced today he will lead a “Save Our Coast” hike along the stunning northern Pacific Coast of Washington this summer to protest the Trump Administration’s offshore oil drilling proposal. The “Save Our Coast” hike, scheduled to begin on Sunday, Aug. 19, will mirror the 22-mile route U.S. Supreme Court Justice William O. Douglas and 71 others embarked on exactly 60 years ago. Douglas organized the hike to increase public awareness about a proposed section of U.S. Highway 101 that would have been built through the untamed northern Olympic Peninsula coast, the longest stretch of undeveloped coastline in the lower 48 states. The federal government subsequently withdrew its proposal to build the highway along the coast. Ferguson’s “Save Our Coast” hike will begin on Aug.19 with a public day hike open to anyone. Ferguson will organize a smaller group to mirror the 22-mile route between Cape Alava and Rialto Beach that Douglas, well-known Pacific Northwest conservationist Polly Dyer and others traversed over three days beginning on Aug. 19, 1958. Ferguson plans to make the trip in three days as well. The hike covers rugged terrain, including traversing around headlands, and is for experienced hikers only. A noted Supreme Court justice, Douglas was also an avid outdoorsman and conservationist. He grew up in Yakima, and knew the northern Olympic Coast well. According to a History Link essay on the hike by Paula Becker, Douglas owned a cabin near the Quillayute River where the hikers camped the night before they began their trek. On the morning of Aug. 19, 1958, Douglas, Dyer and about 70 others hiked from Lake Ozette to Cape Alava, and then turned south along the coast, ending at Rialto Beach near La Push three days later. The hike was intended “to demonstrate the irreplaceable value of the land and advocate its preservation," according to an article in the Seattle Post-Intelligencer. To celebrate the 60th anniversary of the Justice’s hike, Ferguson plans to lead the “Save Our Coast” hike up the coast from Rialto Beach to Cape Alava, retracing Douglas’ route in reverse. Details of the route will be finalized at a later date. Information on the hike will be updated on the hike’s Facebook event page. Ferguson recently sent a letter to Interior Secretary Ryan Zinke opposing President Donald Trump’s proposal to allow oil and gas drilling off Washington’s coast. In his letter, Ferguson invited Zinke to join him on a visit to Washington’s coastline. Ferguson also warned Zinke that if the Trump Administration moved forward with its proposal to put Washington’s coastal communities at risk, Ferguson planned to initiate litigation against the Administration to protect Washington’s coast. Ferguson, a fourth-generation Washingtonian, spent a week in 1998 hiking from the Hoh River north to Shi Shi Beach. In his letter to Zinke, Ferguson called it one of the most memorable experiences of his life. 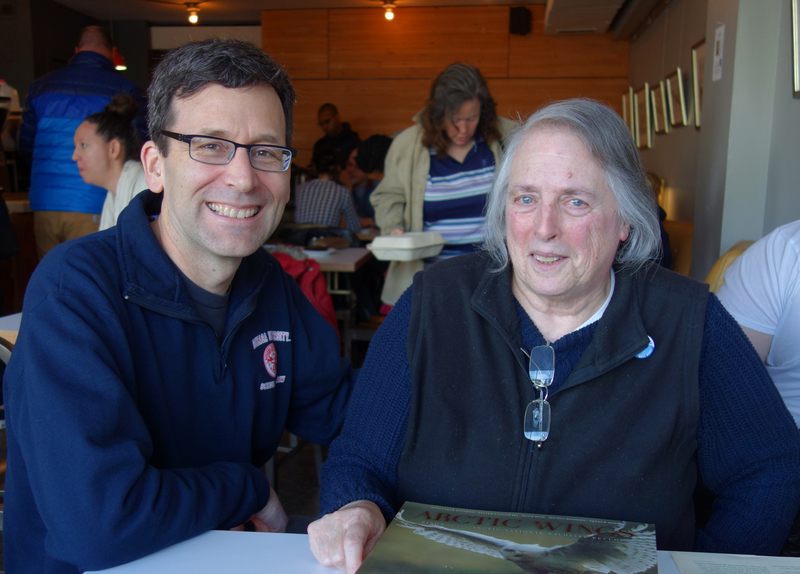 Ferguson recently sat down for coffee with Donna Osseward, who participated in the original 1958 hike. Ms. Osseward is President of the Olympic Park Associates. A photograph of the meeting is included in this release. If you participated in Douglas’ 1958 hike, or a reunion hike Douglas and Dyer organized in 1964 to protest a proposed “scenic route” along the same coastline, Ferguson would like to hear from you. Please contact Judy Gaul at (360) 664-9083 or by email at judyg@atg.wa.gov.